Good morning! This is Angela again, and I am excited to share today’s project because it involves two of my favorite things: the color gold and advent calendars. All of my Christmas decorations are gold, I love it! I have always love the color gold. It was even one of my wedding colors. I love when Christmas comes and I have an excuse to fill my house with one of my favorite colors. Second, I love advent calendars! We had one growing up. It was my favorite tradition. Now with my own kids, I have four different advent calendars! I already shared my diy activity advent calendar. 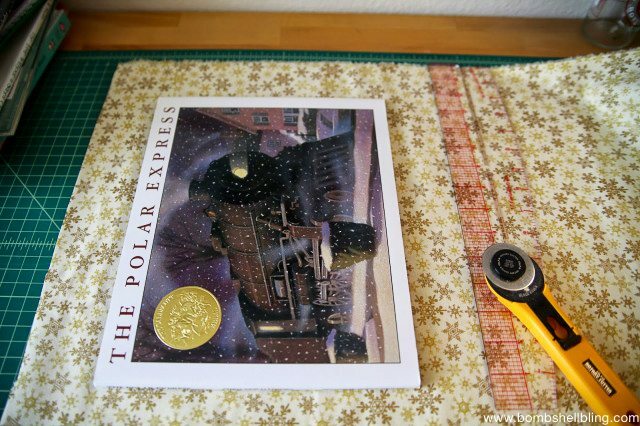 One of my favorites is our book advent calendar. Every day until Christmas my kids get to read a Christmas book. In the past it has only been a 12 day advent calendar, because I didn’t own enough Christmas books. This year I decided to pick up an additional 12 books from the library. We’ve got 24 Christmas books to read this month! The kids are loving it! I also decided that this year I would make some bags to make this tradition a little more fun. In the past I never wrapped the books, I just let the kids decide what they wanted to read. This year every day is a surprise! 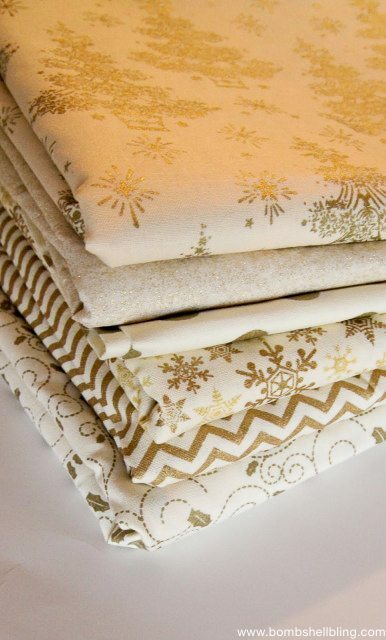 I bought up 2 yards each of 6 different Christmas fabrics. First you take your book and lay it down on the fabric. Make sure the fabric is folded in half with the fold on one end and the selvedge on the other end. Then measure two inches on each side of the book. Then make your cut. Not all of my bags are the same width. They range from 12 – 18 inches depending on the size of the book. The length of the bag may seem really long. You may be tempted to cut it down, but don’t. 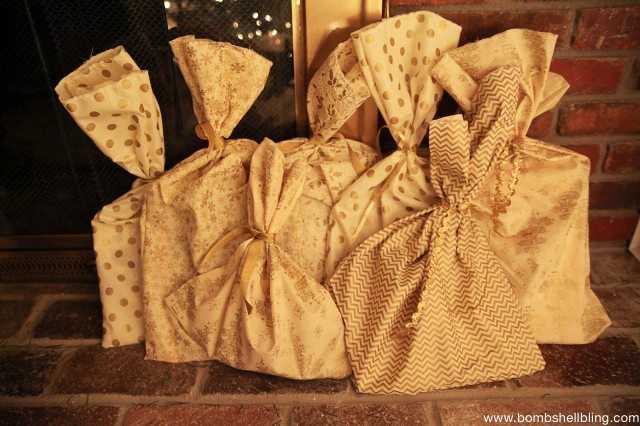 When you go to tie the bags, you will want that extra length. Then with the right sides facing, you will sew up the two open sides. Then hem the top of your bag. I actually just used my serger to hem the top of my bags. All of the steps are simple. This project came together really quickly. 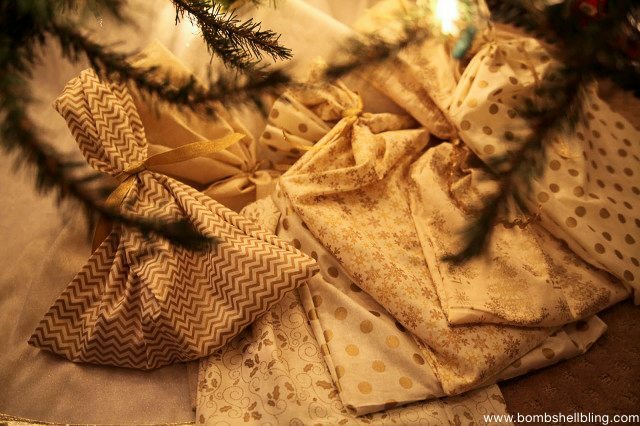 Once all of the bags are sewn, put the books inside, and then tie them with ribbon. I used various sized ribbons and ric rac. I was planning to put all of the books under the tree, but it was a little too much. 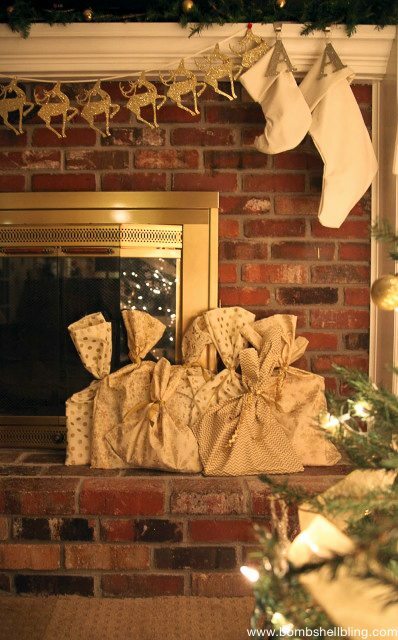 I have some under the tree and some in front of the fire place. Enjoy making some Christmas memories! If you like this idea then you may also enjoy Sarah’s family’s tradition of Christmas countdown service chains!